Bow windows are a beautiful way to invite more sunlight and space into your house without adding extra square footage. The bow look adds a distinctive touch to your home. 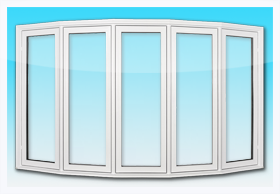 Bow windows are composed of four or more equal size windows, and give you a half-moon shape. They are typically made up of two or three fixed (stationary) windows in the middle and casements on either side. We offer you a bow window in any size, plus, because of the gradual curve that the shape of the bow projects, we can make them with your choice ranging from four to ten equally size windows. We always include two ventilating sections. Bow window significantly increase the elegance of your house, and used for display of plants, figurines and as a "sitting window". for fresh air circulation and temperature comfort, any or all sections of our Bow windows can be made to open by adding any of our operating system options. Bow windows can be greatly enhanced by our grille options as well as many of our accessory options.